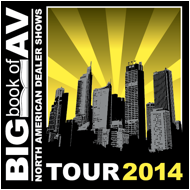 The 2014 Stampede Big Book of AV (BBOAV) tour will focus on education and technology when it docks at the Westin Boston Waterfront in Boston, Massachusetts on April 17th. Boston participants can expect to learn from Paul Dragos, who will present “Sony Unified Communications and Video Conferencing Fundamentals for the ProAV Market.” The presentation will unveil Sony Video Conferencing, MediaPointe streaming, Automated Workflow process for content management and Radvision United Communications. Boston will also feature an afternoon talk with Jim Feldman, Change Management Expert at Shift Happens, who will walk attendees through a path to not only manage change, but also create it. He will modify the focus from process to results and linear problem solving to creative problem solving. There will also be two seminars that offer a look on innovative new technology in education. The first course, “Tablets in the Education Market,” presented by Brawn Consulting and sponsored by Samsung will provide a new take on digital signage displayed in classrooms. The course will also introduce Smart School technologies and how this will help solve problems in overcrowded classrooms. A second seminar, “Collaboration in the Corporate and Education Setting,” presented by David Heeg, Distribution Sales Manager at Christie Digital, will update attendees on the latest technology in presentation and multi-site meeting management. Stampede is offering a hefty training session lineup with a variety of conferences on different Pro AV and Consumer topics. Highlights include; Video Conferencing Fundamentals, sponsored by Sony; Collaboration in the Corporate and Education Setting, sponsored by Christie; Tablets in the Education Market, presented by Brawn Consulting and sponsored by Samsung.